It's very important when choosing a removal company that they have adequate insurance policies in place. 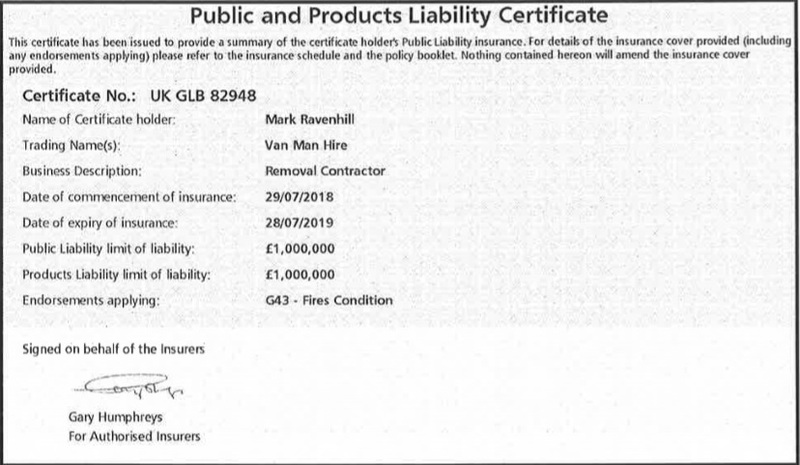 Cheap Man and Van firms are often sometimes 'too cheap' which is because they don't have any insurance in place and don't take any care with your belongings. Van Man Hire is a professional, reputable removal company with years of experience in the industry. Here you can view our current Public Liability Insurance Certificate and download or view in your web browser a PDF copy of our Goods in Transit Insurance document for your peace of mind when booking a removal service with us.